Add another layer of beautiful fabric to a bedroom with an upholstered headboard. A bed anchored with the right upholstered headboard and dressed with wonderful linens becomes an inviting focal point and a luxurious place to spend the night. 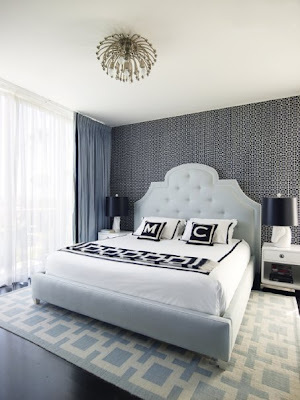 Headboards can be wall mounted, attached to the bed or in some cases free standing. Upholstered beds are a streamlined alternative to the traditional bed skirt but should be treated with stainguard or upholstered in an easy clean fabric. 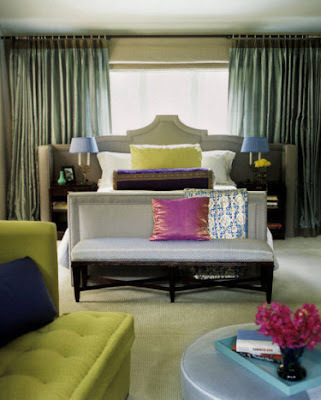 If a removable bedskirt is your preference, match the fabric to the headboard to acheive a restful and unified look. Copyright Lily Hodgson Design 2012. Simple theme. Powered by Blogger.